Figure 1. 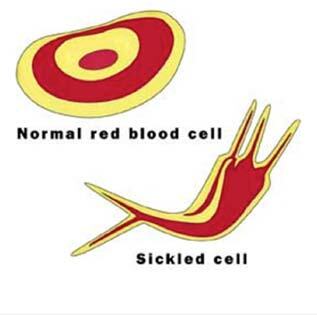 Normal vs. Sickle Cell affected red blood cell. The spectrum of clinical involvement includes skeletal and extra skeletal tissues of the body. The skeletal manifestations of SCD may affect all age groups. Bony changes are due to hyperplasia of bone marrow and thrombosis that causes vascular infarction. Painful vasoocclusive crises is the most commonest skeletal manifestation in SCD, a substantial majority of those may resolve over days without having any permanent sequelae. Avascular necrosis of the femoral head is one of the common skeletal sequelae of SCD. This could be a bilateral involvement. Avascular necrosis of bone, particularly of the femoral head, is challenging for patients and surgeons because it can produce significant pain and functional disability with no clearly proven ways of preventing progression of early stage disease. There are two popular classification systems for avascular necrosis (AVN) of the hip. These classifications are used for avascular necrosis from other causes (trauma, steroids, alcoholism) as well as for avascular necrosis from sickle disease. It is worth paying close attention to the etiology of avascular necrosis as well as the stage of disease because sickle cell AVN has a very poor prognosis compared with other causes, as further detailed below. In addition to the stage of collapse, the Steinberg classification 14 also includes quantification of the area of the femoral head involved by careful measurement of the plain x-rays. The Ficat classification 6 was described in a paper published in 1985 which is among the classics in defining the pathoanatomy and pathophysiology of avascular necrosis. In this paper Ficat argued that avascular necrosis was analogous to a compartment syndrome of bone and could be treated in an analogous way by core decompression. The classification relies on functional testing of the bone with measurement of intraosseous pressure, venography, and core biopsy all of which are painful and invasive procedures no longer in widespread use. It is the clinical and plain x-ray aspects of the classification which have stood the test of time. Most textbooks, and therefore most trainees, discuss the Ficat system, but there are advantages to using the classification proposed by Steinberg. Steinberg’s classification is quite similar to that of Ficat for stages 0, 1 and 2 (early stage disease) with the main difference being that disease, not apparent on radiographs, is detected by either bone scan or MRI instead of functional testing of bone. While Ficat considered a crescent line to be ‘between stages 2 and 3’ (difficult! ), Steinberg has divided late disease into finer stages with 3 being the crescent line and 4 through 6 progressive degenerative changes as outlined in the table. Importantly, for use in Africa, the Steinberg system relies only on careful evaluation of plain radiographs for all distinctions except that between stage 0 and stage 1. There has been a medical revolution of treatment of SCD. Many sickle patients are treated with hydroxyurea, 3 a myelotoxic drug. The net effect of the marrow toxicity is to mildly suppress hematopoeisis and stimulate increased production of fetal hemoglobin (Hb-F), which counteracts the tendency to sickle and reduces the manifestations and progression of the disease. Symptomatic avascular necrosis of the femoral head in adults has a very high probability of progression. Hernigou  reported on 92 symptomatic hips among 64 adult patients with sickle disease in a single centre prospective consecutive cohort study. Seventy five hips had no radiographic collapse at presentation and all but ten of them had progressed to collapse within five years, with an average time to collapse of 42 months for stage 1 disease and 30 months for stage 2 disease. After 17 years of follow-up, 88 of the 92 hips had undergone some sort of operative procedure to treat intractable pain. In addition, the contralateral hip (if normal) showed plain X-ray changes of avascular necrosis among 20% of patients, and bilateral disease could be diagnosed in 23% of patients if symptoms or MRI findings were considered also. This prompted a study of the fate of the asymptomatic hip in patients with sickle disease. The same author published a 2006 paper  following 121 initially asymptomatic contralateral hips in patients with sickle cell disease who were being seen for hip pain on the opposite side. Among these asymptomatic hips, 56 had normal plain x-rays and MRIs on presentation, 42 had abnormal MRI findings but normal plain films, and 23 had abnormal cystic or sclerotic appearance of the femoral head on plain films. The vast majority of asymptomatic hips became painful. Among those with abnormal plain x-rays at presentation 80% were painful by 2 years, among those with normal plain x-rays but abnormal MRIs 80% were painful by 3 years, and among those with normal plain x-rays and normal MRIs 80% were painful by 16 years. 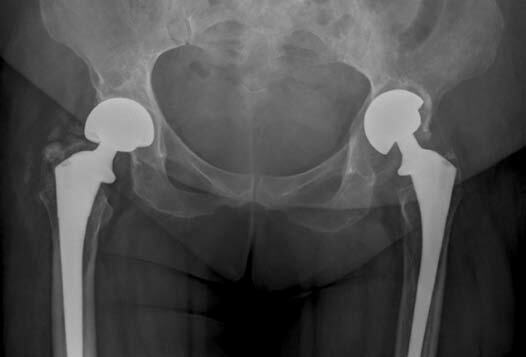 Progression to collapse of the femoral head was seen in 100% of stage II hips within 5 years, 80% of stage I hips within 8 years, and 50% of otherwise apparently normal hips within 15 years – a dismal prognosis for an asymptomatic and apparently normal hip to say the least! Compared with the poor prognosis for either symptomatic or asymptomatic contralateral hips in adults with sickle disease, children seem to fare a little better after osteonecrosis in sickle disease. Perhaps this is related to the remodeling potential of the growing skeleton. Again the study was reported by Hernigou  this time on 52 children with sickle related avascular necrosis from a mean age of onset of 12 years and with 19 years of follow-up. Only 1/3 of them had progressed to symptomatic osteoarthritis (stage IV disease or higher) and progression was more common among children with greater degrees of femoral head deformity from childhood, although some children with a completely round, nondeformed femoral head had progressed to osteoarthritis, strongly suggesting that biological factors play a significant role – for example there may be persistence of inflammatory pannus which eventually destroys even a mechanically perfect joint. Among the 31 patients, 2 had a second episode of avascular necrosis of the same hip during adulthood. In summary, over 20% of adult sickle cell patients will develop avascular necrosis of the femoral head. Among those who do, progression to end stage hip disease is very common if they are followed for long enough. In addition, even an asymptomatic and radiographically normal contralateral hip has a high risk of progression to end stage arthritis as well. The avascular necrosis will go through phases of healing and infarction ultimately leading to osteoarthritis which could be functionally disabling to the patient.Classically these patients are of relatively younger age, 2nd or 3rd decade of life, than the typical osteoarthritic patients in their 5th or sixth decade or even older. Often, these patients are referred by hematologists or primary care physicians.It’s very crucial to establish the exact symptoms for which the patients are suffering.It’s not uncommon that patients with SCD , although may have a positive imaging studies (X-ray or MRI) for Avascular necrosis, they may very well be having alternate etiologies for their symptoms. We make it a point to see these patients few weeks (4-6 weeks), after the resolution of their acute attack of vasoocclusive crisis, in order for the acute pain to have subsided.At times acute or resolving synovitis from the acute painful crises might make the assessment of the hip osteoarthritic very challenging and confusing. We found that there are two common areas where the pain could be coming from apart from the affected hip. The sacroiliac joint, (figure 2), is often involved to a various degree and serves as a cause of pain.Clinically it’s confirmed by figure of 4 test, or by using a differential block injection for the SI joint . Figure 2. Sacroiliac Joint Involvement in Sickle Cell Disease. Lower back pain , remains another differential for any hip pain.Proximal femoral metaphyseal infarct as a result of SCD may serve as a source of pain as well. In cases where it’s clinically too difficult to identify the source of pain, the affected hip could be injected by local anesthetic agent to rule it in out as a cause of pain. 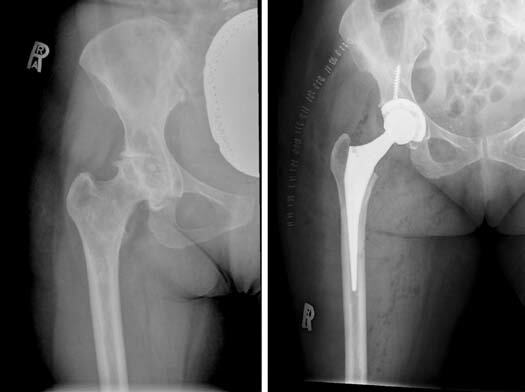 Once the diagnosis is confirmed and all nonoperative treatment modalities have failed, the discussion of total hip arthroplasty should be taken in great depth with the patient.It should be clearly highlighted to the younger SCD patients being considered for THA, that they will have to take risk of possibly having the THA revised once or more in their lifetime, in addition to the risk of infection and other technical issues of bleeding and possible fracture and perforation intraoperatively due to the deformity of their femora.If not seen by a hematologist, all sickle cell disease do have to be optimized by the hematologist. In our institution, they get admitted a day prior to surgery to ensure that they’re free from any infections mainly chest involvement and that they are hematological optimized. We do not practice exchange transfusion. Our hematology colleagues believe in either pre op transfusion if needed, or intraoperative or postoperative transfusion, which will automatically dilute hemoglobin A levels. As in the literature we also recommend adequate hydration and use of perioperative antibiotics and analgesia. Most of patients with sickle cell disease are small built and short stature.Therefore we do ensure that our implant inventory contains smaller sizes femoral and acetabular components with respective heads and liners. As these patients are predominantly young, we use cobalt chrome metal, or ceramic heads on highly cross linked polyethylene liner as our standard choice of implants. Figure 3. 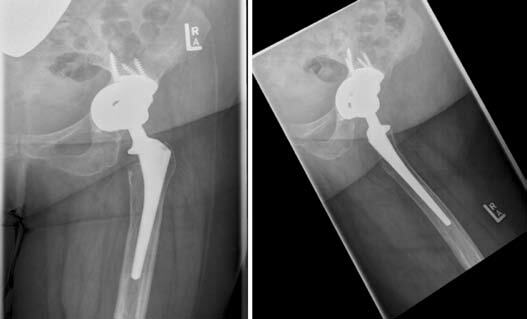 Sickle Cell affected hip joint, pre and post op x-rays using the regular implants. In the usual cases of non-sickle patients we usually just rasp the femur prior to implanting the formal femoral component. But in patients with SCD we do consider reaming the femoral canals in to avoid any inadvertent deflection of the femoral component causing perforation. We always use a guide wire to check repeatedly the direction of our femoral canal reaming and rasping. Figure 4. Extremely narrow femoral canals in a patient with Sickle Cell Disease. 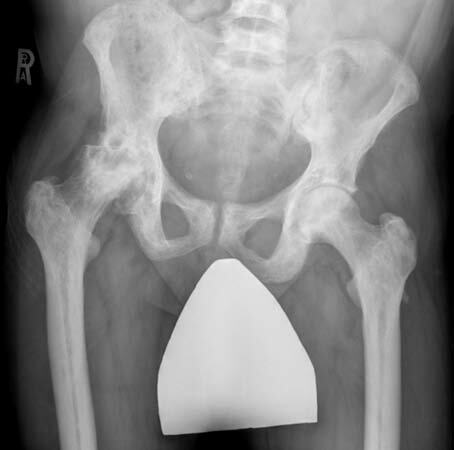 Judicious use of X-rays or image intensifier are encouraged in these cases to detect any unexpected perforation, fracture or malpositioning of the stem or the cup. 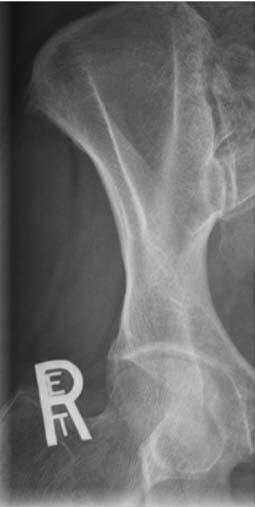 Fracture of acetabulum or femur have been reported in patients with sickle cell disease. Our post op rehab protocol remains the same for patients with SCD and those who are not having SCD.The pain control post operatively might take longer to achieve it’s goal in comparison to those who do not have SCD. A major factor in this point is that these patients do already have been on chronic pain medications including narcotics , making their requirement for pain medications dosage to be higher and the rate of pain relief much limited. The concern of implant survivorship in young patients does apply to these group of patients as well. The type of fixation, cemented vs. cementless has been a topic of debate in the past, although recently cementless fixation are showing satisfactory results.A greater cause of concern in these patients is infection and subsequent loosening.A number of authors have cited various complications in THA in SCD patients. Al-Mousawi et al  reported 8 septic loosening in their series of 43 THA performed in 32patients. They also reported perforation in seven acetabulum and four femurs. Aseptic loosening were reported in only one patients, wound hematoma in 5 patients.Acurio et al  reported 20% infection rate, 40% revision rates at a mean of 7.5 years in their 25 THA cases done for SCD. The authors recommended to be cautious using methylmethacrylate as that could carry a higher risk for infection. Their rate of revision was much higher in the cemented group 59% vs 22% in the cementless group. Theoretically cement may provide an immediate rigid fixation and less intraoperative blood loss, decreased risk of femoral perforation, and minimizes the risk of possible suboptimal biologic fixation in a situation with compromised bone stock. 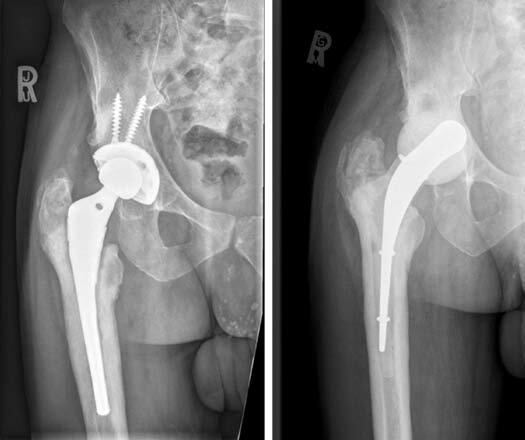 The majority of contemporary reports of THA in SCD support the use of cementless femur and acetabulum fixation , with screws recommended as supplemental fixation in the acetabulum. Figure 5. 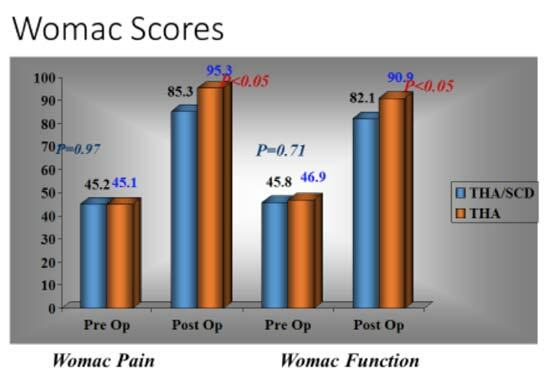 Pre Op & Post Op Pain & Quality of life scores in patients with and without SCD undergoing THA. We also have noticed that some of the SCD THA patients do not tolerate lengthening by more than 5-7 mm ,further than that they may start develop paresthesia and tingling.We apply the same revision THA protocol for work up & treatment of loosening of components in THA in SCD or non SCD patients. (Figure 6). Figure 6. (A, B) Infected THA 10 years post op in a sickle cell disease pateint treated with 1st stage revision, (extraction with antibiotic spacer insertion). Figure 7. (A, B) Post op xrays of infected THA treated with two stage reimplantation. Figure 8. Bipolar Hemiarthroplasty in patients with SCD done 12 years earlier. Figure 9. 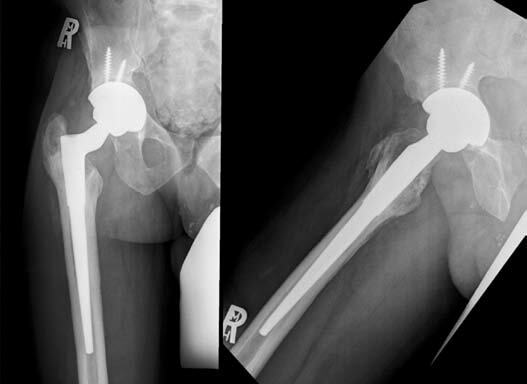 Post op x-rays of the Bipolar hemiarthroplasty revised to THA. THA in SCD patients presents both medical and surgical challenge. The increased likelihood of complications are due to the nature of sickle disease itself.Various preoperative and intraoperative issues needs to be taken into consideration, in regard of period optimization , type of implant, surgical techniques, method of fixation. In spite of the variation in published compilations following THA in SCD, it still remains a very attractive procedure providing pain relief , function & satisfaction.in properly selected patients with SCD related AVN and or osteoarthritis.